Is there really such a thing as an anger addict? Actually, yes, there are people who have an addictive pattern when it comes to anger. We all can get angry. That's normal. Some of us even have such strong issues with anger that require us to learn how to manage anger. What makes an anger addict different from these people is that there is a pattern to their anger. It's almost predictable, even rhythmic, and will happen with regularity, a bit like clockwork. Most of us only get angry in response to something. While people who have problems with anger have built-up anger that just needs an excuse to get released, but it usually doesn't come out without being triggered. An anger addict, however, will blow whether a trigger exists or not, because they have an anger addiction cycle that determines their response not an external event. This addiction cycle is about satisfying internal needs that are often unrelated to the circumstances prompting the angry outburst. 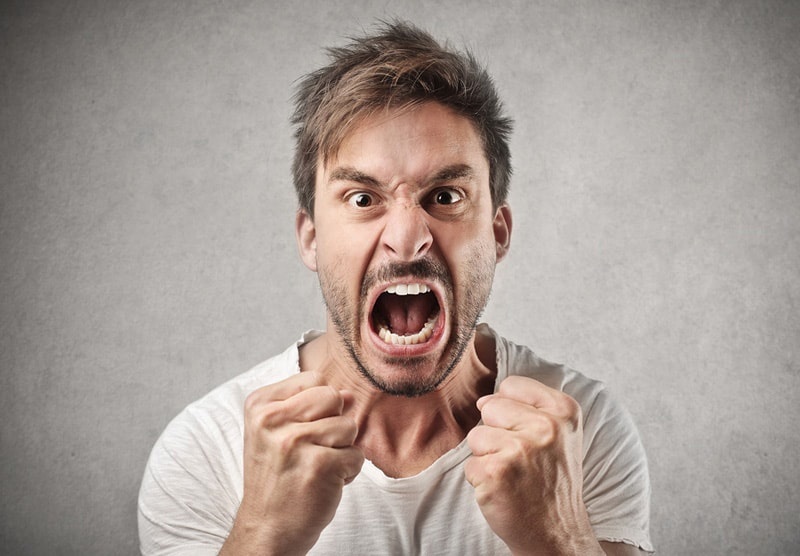 Below are several factors that can contribute to someone becoming addicted to anger. One factor is the chemicals in our bodies that are released with anger. When we experience anger our bodies instinctively go into fight or flight mode. As part of that response adrenaline is released into the bloodstream. This hormone boosts energy and dulls pain among other things. The high that it produces is often called an adrenaline rush, and people who seek that out can be called an "adrenaline junkie." People can become addicted to this chemical high, even when it results from anger as opposed to a thrill-seeking sport like skydiving. Some anger addicts use this high as a stress reliever, to cope with depression, or to dull emotional pain. The positive effects then internally reinforce the pattern. It's pretty common for people to feel better after an anger release and be able to move on without any negative effect, while those on the receiving end are still reeling from their response and are left to put the broken pieces back together. Anger can become addicting not just because of the chemical impact it has, but also for the way it protects us personally. Some anger addicts use it to deal with conflict by getting angry and attacking first, rather than waiting to respond to an attack when they're more vulnerable. Anger can protect us from uncomfortable feelings, such as pain, as it covers over other feelings, distracts us from them, and provides a chemical balm to soothe them. This benefit makes having a self-protection mechanism like rage become very addicting as we use it as a coping mechanism, to avoid feelings, and to protect ourselves. Since anger can protect us from getting hurt, or from feeling feelings that we don't like, it can become a tool to manage, or more accurately avoid, interactions with other people. This is especially common in intimate relationships and is one of the reasons why it's most frequently with the people we love where our anger gets out of control. It becomes addictive because of the benefits relationally that it provides, such as controlling communication, giving power, and creating distance. Add these factors together and it begins to make sense how someone could become addicted to anger. The personal and relational benefits make it a behavior that gets rewarded, on top of that it gets chemically reinforced, all of which form the perfect ingredients for developing an anger addiction. How do you help an anger addict? Recognize that you're not the problem and so you can't fix it. Actually, the addict can’t fix-it either, at least not by himself or herself. This type of anger problem requires professional counseling help to resolve. Realize that denial, justification, and blame are the biggest obstacles that must be overcome before addressing it even becomes an option. So if you love someone who has this problem, your goal needs to be to first break through these defenses. You can begin to whittle away at the defensive walls by picking a neutral time to talk, and briefly describing their behavior and the impact it has on others. In counseling men I have found that they may not always be empathetic about the affect on their partner, but they can be very concerned about the impact on their kids. Usually anger is unpredictable, not with an anger addict. You may not always know when it's coming, but you know it's coming. So gets some help and put a stop to it.